The Exchanger cryptocurrency reputation had experienced a decline when MTGOX was reported to have been hacked and suffered a loss of 450 million USD. Along with the many new coins that appear every day, the role of the exchanger is very important, where the new coin requires a place to be exchanged with BTC or ETH. The size of the crypto market makes some people try to make cryptocurrency exchangers with the aim of making it easier for all developers to register coins. Not hypocritical, that our goal of investing in a particular coin is to get ROI, therefore the first and most mandatory thing is to register coins on the exchanger. Why do I call EXCOLONY a New Home? Because the existence of Excolony is needed by the cryptocurrency community who often conduct digital currency exchange transactions. In some cases before, there were many cryptocurrency exchangers that I thought failed in carrying out their duties to serve users. The problem of wallet hacking is always there, even more dangerous is that some exchangers do not insure all of their assets. This is where the role of EXCOLONY began to be considered as a new place to conduct cryptocurrency exchange transactions safely. 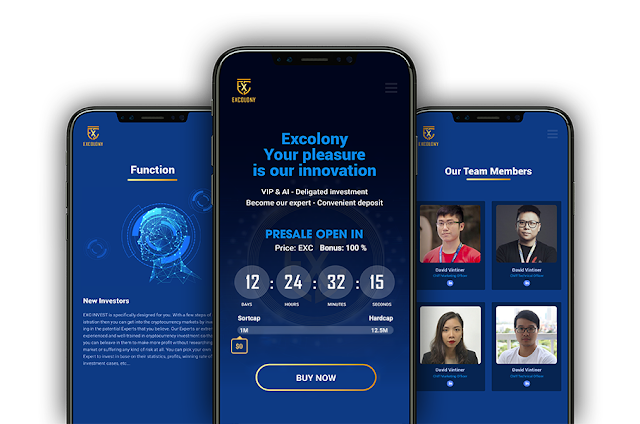 EXCOLONY is a centralized cryptocurrency exchange platform that implements off-chain matching machines to handle large amounts of transactions and support complex orders. The main purpose of EXCOLONY is to enable everyone to be able to make transactions while creating an ecosystem to conduct transactions in real time with low data sharing costs. EXCOLONY has the speed to process large amounts of transactions quickly, but still has a security system such as a decentralized exchange. This hybrid work system, allows everyone to be able to exchange cryptocurrency safely and comfortably. Some of the things that make EXCOLONY different from other centralized exchagers is that there are some special skills possessed by EXCOLONY, including the ICCO (Initial Convertible Coin Offering): ICCO is a new innovation in the ICO world where an investor will get company shares based on the coins they buy and provisions imposed by related platforms. AI Trade: by utilizing blockchain and AI technology, allowing a platform to store data on a block. Excolony's AI can analyze trends, install buy orders or sell orders quickly, manage risk and also identify stable coins. EXC Coin offers several benefits that can cause EXC Coin to become a rare coin. As we know, that EXC Coin's total supply is very limited according to what is stated in the whitepaper. Coin EXC can be used to participate in ICCO, which means the company will appreciate EXC Coin holders with Shares. Here the loyal investors of EXCOLONY will be honored and honored. For those of you who want to become VIP members of existing AI technology, then you also need to need EXC Coin as the fuel. One of the most interesting uses of EXC Coin, Coin EXC can be used for insurance in following an ICO. Yes, the developer allows the purchase of ICO coins using EXC Coin, and if the ICO fails or all the money will be returned in EXC Coin form. And of course free trading fees if you use EXC Coin to be exchanged with ETH, XRP, BTC and others.